Many view hot air ballooning with curiosity and mystique. What is it like up there? What can you see? What about the landing? Is it cold? A balloon flight is a form of flying like no other. You can see in 360 degrees for miles on end, and your flight feels absolutely uninhibited and free. As the landscape shrinks into miniature, a model world appears below and familiar landmarks take on new perspectives. Whether you are close to the ground viewing the fascinating wildlife, up amongst the clouds marvelling at their powdery appearance, or peering down at dramatic cliffs, rolling hills and toybox towns, you will be intrigued by this aerial mystery tour. Hot air balloons are flown first thing in the morning and last thing in the early evening during daylight hours from spring to autumn and sometimes, throughout the day in the winter, subject to weather and suitable ground conditions (see below). Ballooning – an experience for everyone! A hot air balloon flight is a wonderful experience for absolutely everyone. You don’t have to be an adrenaline-lover, balloon flights are in fact very calming experiences known for allowing passengers to relax and enjoy the spectacular views. We have flown passengers from seven to one hundred years of age over the past 25 years, so ballooning really is an activity for all. For more information about flying restrictions for people with medical conditions, disabilities or mobility issues please read our FAQ’s or call us on 01404 823102. We cannot fly anyone who is pregnant. Here at Aerosaurus Balloons, we know that ballooning is a fantastic experience whether you are booking a one-person slot or a large group, so we accept bookings for individuals or groups of up to 100 people. Individuals or small parties are combined with other parties to make up complete flights. On such a special occasion our passengers always gel so brilliantly together, from all helping with the rigging and derigging on the balloon, to marvelling together at the stunning views, mutually enjoying this thrill of a lifetime. Extended hot air balloon flights of approximately 1 1/2 hours duration are also available by special arrangement. We also provide a number of other special flight arrangements and customisable options. Aerosaurus are always delighted to help you add the magic to your occasion, whether it be a birthday, anniversary, proposal or even a wedding. For these important moments we can offer private balloon flights and special options to our passengers. Our fleet can also attend corporate events, whether to fly your attendees providing an amazing experience or simply to create a beautiful backdrop. We can aid in promotions, openings, festivals and a whole range of arrangements to make your event that extra bit special. Hot air balloon flights are subject to weather conditions for the safety of our passengers. If we are unable to fly on your preferred date, your flight will moved forward to to the next mutually convenient date. For these reasons we cannot guarantee balloon flights on specific dates, although we will try our best to arrange a flight that works well for you. The most important aspects of the weather are that there must be wind speeds of less than 12 mph, good visibility, a stable atmosphere and no rain or snow. As hot air ballooning is so weather dependent, we try to counteract this problem by providing maximum flexibility for our passengers. Aerosaurus provide a full time, 7 days a week service and have several hot air balloons varying in size from 2 passengers up to 16 passengers. 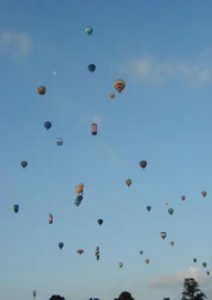 We offer balloon flights daily from a choice of beautiful launch sites in Cornwall, Mid & East Devon, South Devon, Somerset, Dorset or Wiltshire.